They share the same surname. But many gardeners are surprised to find that these two lovely ladies of the garden are not sisters--or even cousins. In fact, these two similarly named plants are totally different species. The lily, Lilium, is a hardy bulb that can be planted in the fall or spring, and will bloom year after year. The daylily, Hemerocallis, is a perennial that grows in a clump and also returns to the garden each year. They also wear different foliage: Lilies have long, elegant stems along which grow leaves and flowers and daylilies have grasslike foliage out of which rise flower-topped bloom stalks. 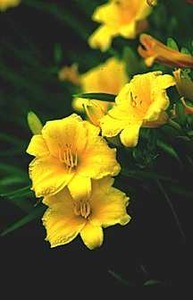 The often-mistaken identity comes from the similarity in their flower form--they both bear lovely trumpet-shaped blooms. And although lilies and daylilies may appear to some as twins separated at birth, gardeners embrace their differences and use both in their beds, borders, and landscapes. Vive la difference! Lily, daylily, DIFFERENT FLOWERS, WHAT IS THIS PLANT?